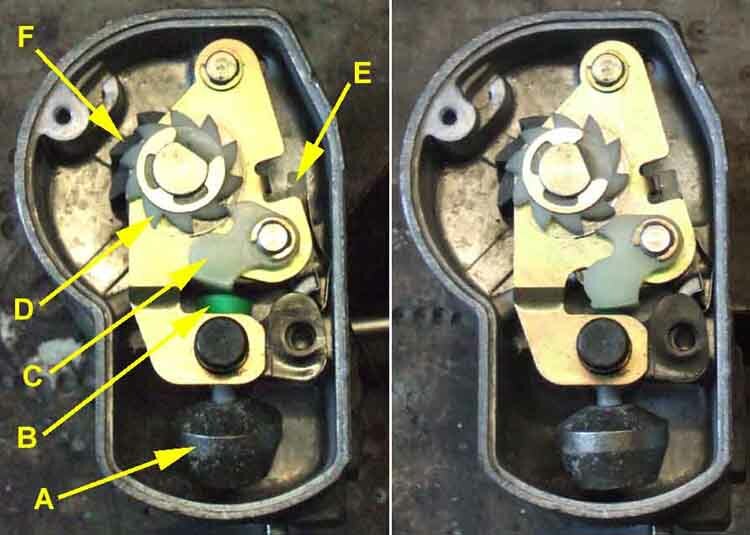 Vee's original mechanism is very similar to these pictures from Justin Mercier on the TR6-pack forum. Remove one of the screws and slacken the over, then by swivelling the cover round you can expose the spring to be able to re-tension or de-tension it, without it sproinging all over the place. Nevertheless eye protection should be worn, just in case, as it can be pretty violent and has near-razor sharp corners. If it does sproing out care is needed to untangle it without buckling it. 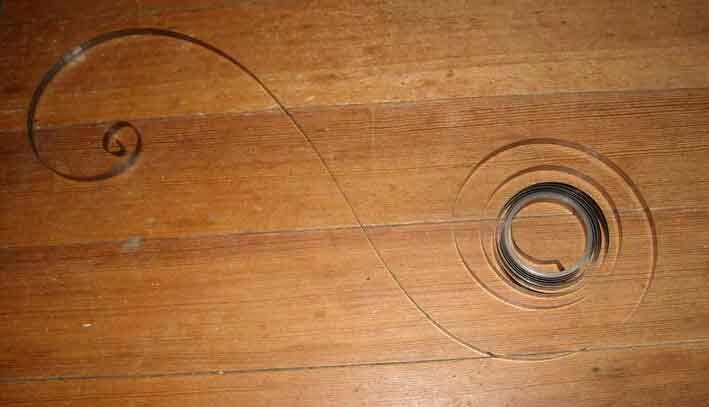 Even so, you end up with the spring curling in one direction at the inner end, then changing to curl the other way for the rest of the spring. It has to go back as the inner, tighter end is curled, for the rest of the spring it has to be curved the other way as it is fed back in. But you have to start with the outer part first, fitting the end into the slot in the body, then turning back on itself, and going clockwise into the centre. The spring has a natural reverse curl like this as it is a way of increasing the tension once fitted, a clever bit of lateral thinking. 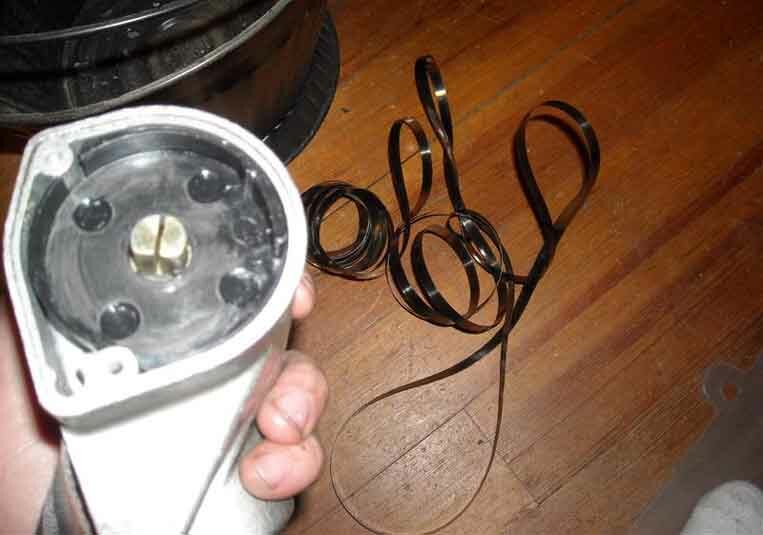 Note that with both this earlier grey-bodied reel and the later black-bodied, as it is withdrawn the belt rotates the spindle clockwise to tighten the spring. If it needs retensioning there are two possible ways, and that is either to turn the inner end of the spring clockwise relative to the spindle to add tension, or to rotate the outer end of the spring anti-clockwise relative to the body. On the face of it this should be easier on the grey-bodied reel as both inner and outer ends are retained by the body when the cover is removed, whereas on the black-bodied type the inner is in the spindle in the body, and the outer is retained in the cover. However with the grey-bodied it does mean that one either has to grasp the inner end of the spring, remove it from the spindle slot, and rotate it clockwise relative to the spring, or remove the outer end from its slot and rotate it anti-clockwise, neither of which sound particularly easy. Theoretically one could pull the belt out a certain amount, detach the spring from the spindle and hold it there, then rotate the spindle anti-clockwise to reel the belt in, then refit the spring, but that sounds even less easy. With the black-bodied by careful lifting of the unscrewed cover the minimum amount, it can be rotated anti-clockwise relatively easily to add tension. 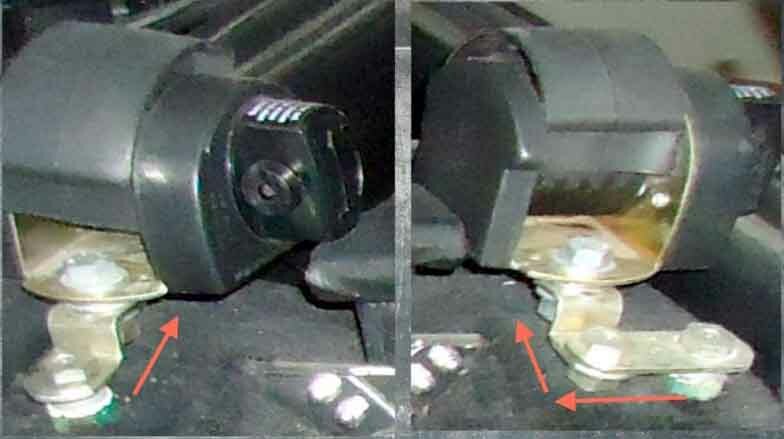 Vee's original belts - a single-action locking mechanism: On the left in the locked position, A is the pendulum that responds so sudden changes in speed, direction or car orientation; B is pushed up as the pendulum moves from the vertical; C is the initial locking lever; D is the toothed wheel that pulls C into the fully-engaged position, lifting E which is the main locking latch, into engagement with the main locking wheel F, to lock the belt. On the right unlocked - B is retracted, C is clear of D, and E is clear of F to allow the belt to be withdrawn. Circlips allow the mechanism to be completely dismantled and reassembled. 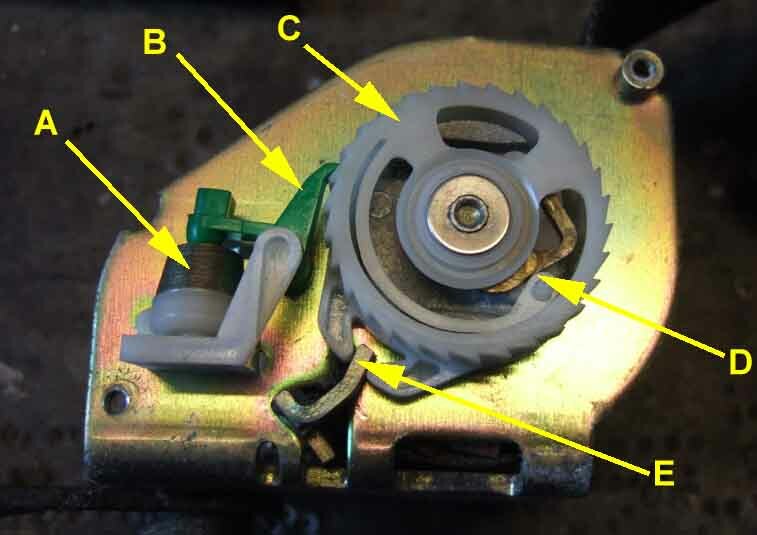 Later belts with a dual-action mechanism: A is the pendulum that responds so sudden changes in speed, direction or car orientation; B is the wedge lifted by the pendulum to lock the wheel C; D is the friction mechanism that responds to the belt being yanked out of the reel which also locks C; With C locked any attempt to withdraw the belt moves the main latch E in the direction of the arrow to engage with teeth on both sides of the reel (not shown) to lock the belt. This has a washer trapped under a peened-over shaft to retain the inertia mechanism, which make dismantling inadvisable if you want to reuse the belt. 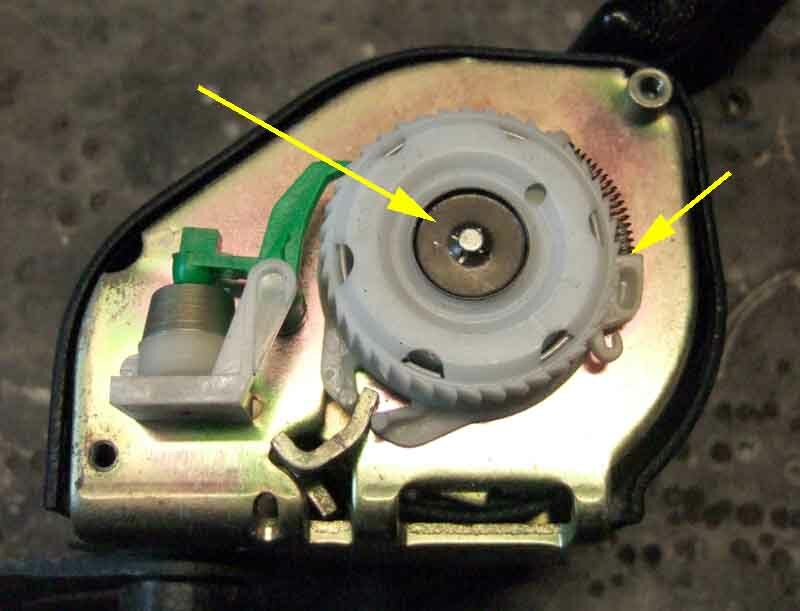 Other versions of the externally identical reel have a spire-clip (A) securing the inertia mechanism, and a different way of triggering the locking action if the belt is yanked out (B). Despite being a spire-clip it's probably inadvisable to attempt removal of this as well in case it does not retain the parts as securely as previously. Showing how the Securon adjustable reels have a large additional 'lump' on one end, which means the right-hand reel can't be positioned correctly on the GT arch without a second bracket at right-angles to the first, as on the right. 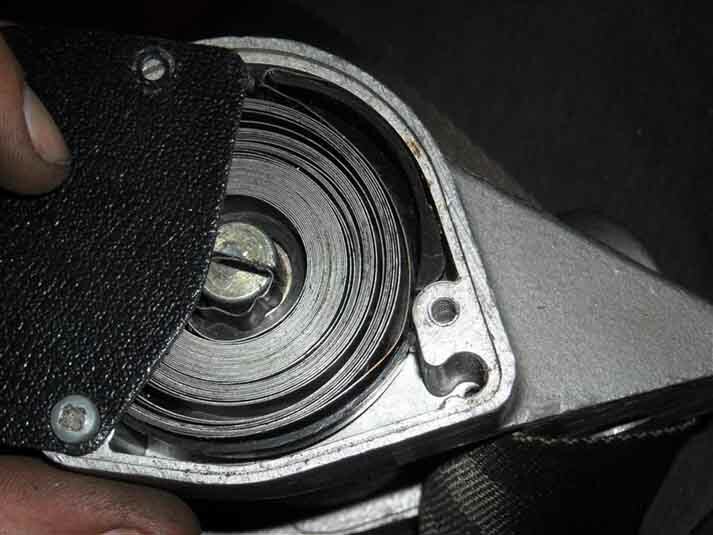 If ever the belt is used in 'anger' the locked reel will almost certainly be pulled forwards a certain amount, allowing the occupant the travel further forwards than otherwise than otherwise would be the case. Absolutely pointless buying this adjustable belt, and Securon don't seem to do a non-adjustable reel where the belts exits forwards as is required for the GT arch-top mounting position, or the roadster, unless they are mounted so the belt exist vertically and has to twist through 90 degrees between reel and shoulder. Non-adjustable belts are available from some sources, but many come with a floppy tunnel belt which would be a pain for single-handed fastening. The MGOC M061 (available singly) come with the stiff stalk (not shown, but they have confirmed it) and fitting kits for roadster and GT are available. Watford Classics shows a kit (pair with brackets) for the GT, and Chase MG one for the roadster (pair with brackets, albeit with red belts), both with stiff stalks.